Most automakers have voids in their lineups that eventually need to be filled in order to take advantage of market developments. Even major luxury brands like Audi and Lexus are missing key models that would dramatically boost sales if available. For instance, Audi could use a smaller, sportier mid-size five-passenger crossover SUV to take on Lexus' segment-leading RX, and Lexus needs a seven-passenger car-based sport ute to fight the Q7. This issue is even more pronounced amongst entry-level luxury brands like Acura and Buick, with Honda's premium division requiring a subcompact SUV to battle the popular Encore, and GM's near-premium subsidiary having long needed a compact crossover to go up against the RDX. Thanks to the new 2017 Envision this latter problem is now resolved, but is it good enough to unseat the mighty RDX. Ask the majority of car shoppers to name the top three most reliable brands in the industry and Lexus would likely earn the popular vote, as it's been touted most dependable for decades. Once again it sits on top of J.D. Power and Associate's 2017 U.S. Vehicle Dependability Study, as well as first place with Consumer Reports' most reliable car brands in America report. Considering Toyota is Lexus' parent automaker and therefore shares many of its components and some platform architectures, at least when it comes to the premium marque's lower end product, choosing it for second place makes sense too, but this is only true for Consumer Reports. Instead, J.D. Power gives the runner up position to Porsche, leaving Toyota in third. I'm guessing you can figure out which brand slots into CR's second rung. Buick, of course. The General Motors division manages a solid fourth in J.D. Power's ranking, which is still mighty impressive considering 31 brands are in contention. Each time I schedule a Buick Encore for testing I don't give it much thought. It's a subcompact SUV that needs to be covered because of its reasonably strong sales, but it's not the type of vehicle that elicits a lot of passion. And then once inside I'm reminded of how nice it is, and on the way home how easy it is to drive. I must say it's even better for 2017. GM just gave it a thorough mid-cycle update including a much more attractive modernized grille, headlights and taillights filled with LEDs, the removal of those silly hood-mounted "ventiports", and of course new wheels all-round, while its interior gets a number of styling and technical enhancements too, plus it continues to drive very well. If the new 2017 Envision looks like a Buick that might have been envisioned a few years ago, complete with a chromed waterfall grille and “ventiports” atop the hood, there’s a good reason. It was actually a two-year old model when it arrived here late last year, having initially only been available in Buick’s largest market, China. 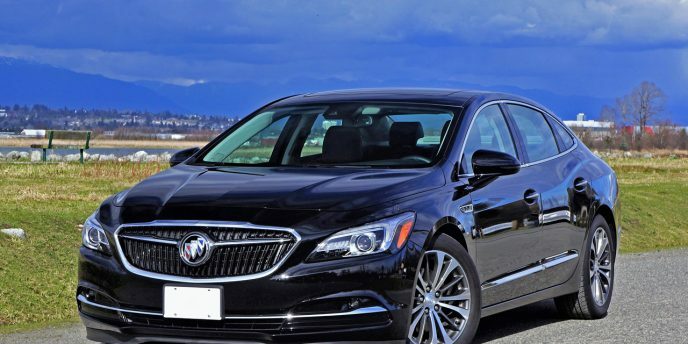 It hails from GM’s very successful SAIC General Motors Corp., which manufactures and sells Buick, Chevrolet, and Cadillac brand vehicles in Mainland China, a Shanghai-based venture that first produced the Buick Regal in 1999 and has since resulted in one of the most formidable U.S.-Chinese corporate partnerships. Those paying attention to all things Buick have likely heard stories about nicer, more opulently trimmed models available in China that couldn’t be had here in North America, so it’s nice to see some of the fruit from this relationship finally heading our way in the form of this very impressive new compact SUV. Yes, the Envision is produced in SAIC-GM’s Shanghai facility and then shipped here, which only makes me wonder why it took so long. Certainly they could’ve picked a better year to do it, with President Trump’s anti-offshoring rhetoric and all, but the U.S.’ bombastic new commander in chief seems more twitterpated with “unfair” Canadian trade practices than anything the Chinese might be doing. Of course, I digress as usual, but in the case of anything Buick related, a “Made in China” stamp makes perfect sense. After all, if it weren’t for the Chinese market there wouldn’t be a Buick today, which means our friends across the Pacific deserve all the jobs this once solely domestic brand can allow for. If it were up to the North American market, we’d be wandering through show ‘n shine shows on Sundays telling our kids about this great tri-shield brand that made now legendary nameplates like the GNX/Grand National, Riviera (how I love anything from 1963–1965), Roadmaster (especially the Skylark), or the Model 40, but now this history is still part of a brand that teases us with new dream cars like the fabulous Avista and Avenir concepts, just like the Y-Job did to our forefathers. Yes, if it weren’t for the Chinese market Buick would likely be history along with Pontiac and Oldsmobile. To be completely clear, global Buick deliveries were 1,432,679 units last year, beating its previous best year ever (2015) by 200,698 for a 16.3 percent increase. Can you guess how many of those sales were from the U.S. and Canada? 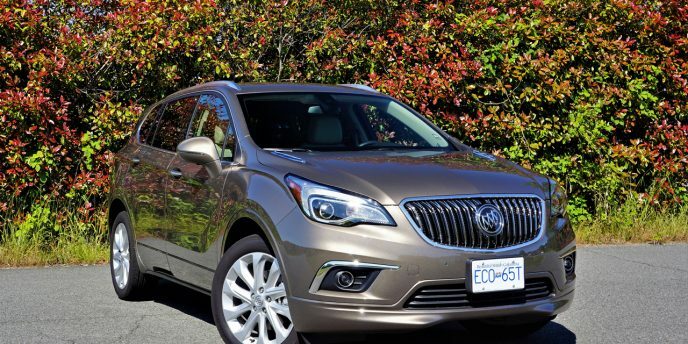 The world’s largest vehicle market accounted for just 229,631 Buick deliveries during the 12 months of 2016, whereas Canadians purchased just 19,053, no doubt many sold to new Canadians of Chinese descent (or at least that’s what my local dealer tells me). So on behalf of all classic automobile brand lovers, thank you China for saving another storied American brand from elimination. Now, can you please do something about Chrysler before it’s too late? While the 2017 Envision might not be the newest looking SUV on the block, or within Buick’s ranks for that matter, it is ideally positioned in the market to push Buick’s North American sales up considerably. The compact luxury SUV segment is Canada’s third largest category amongst premium brands, just behind D-segment cars (sedans, coupes and convertibles) and mid-size SUVs, but it’s one of the fastest growing and therefore represents the greatest opportunity. This is especially true for Buick that’s a virtual no-show in the D-segment with Regal at 841 units in 2016 compared to BMW 3 and 4 Series at 12,217 or Mercedes’ C-Class at 9,954. It did better in the mid-size SUV class last year with 3,632 sales compared to the bestselling Lexus RX’ 8,147, and to its credit owns the subcompact premium SUV category with 4,765 sales, but its Encore is priced nearly $10k lower than its closest competitor so it’s not really a true premium player there. The Envision is, however, in both its pricing that starts at $40,295 plus freight and fees, which is square in the middle of the premium pack (and a lot lower than GM Canada initially targeted), and its standard and available feature set. As for build quality you’ll need to come back and read my review for the pros and cons, and believe me I won’t hold back. 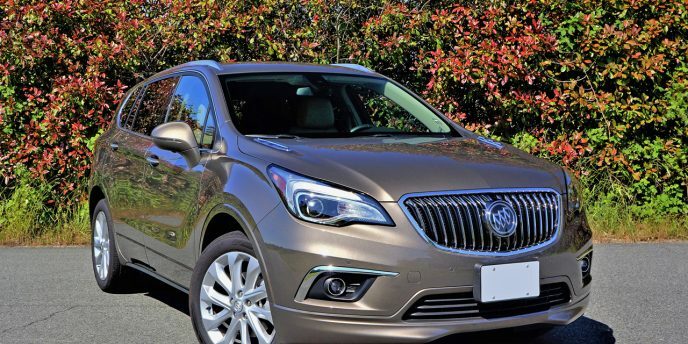 My tester is equipped in full load Premium II trim, which means its equipped with almost everything Buick can throw at it, except some obvious options that should have been added to optimize the experience. That’s no fault of the vehicle, the Envision an SUV worthy of mixing it up in the premium crowd, but I can only imagine the folks in Oshawa didn’t want any of us journos to gripe about a price tag that rubs up against $60k when optioned out (its fully equipped MSRP is $56,825 before freight or dealer fees). 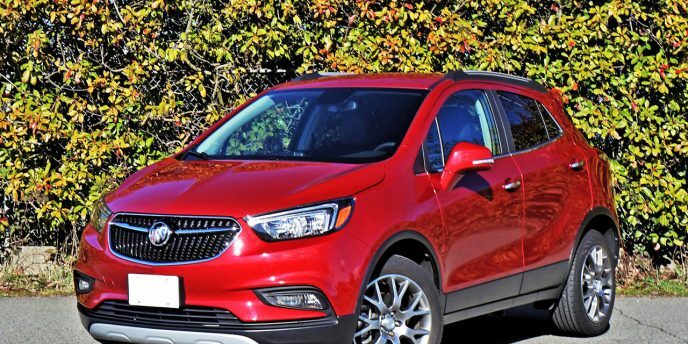 Still, do so with most of the Envision’s competitors and you’ll face similar sticker shock, or considerably more if it’s European-sourced, which makes this Buick a more value-oriented premium compact SUV, and reason enough for strong early sales. If you were to ask most car shoppers to name the top three most reliable brands in the industry, Lexus would likely earn the popular vote as it’s been touted as most dependable for decades. Once again it sits up top of the J.D. Power 2017 U.S. Vehicle Dependability Study as well as first place in Consumer Reports’ most reliable car brands in America. Toyota in second place only makes sense, as it shares many of its components with Lexus models, at least when it comes to the premium brand’s lower end product, but this is only the case with Consumer Reports, J.D. Power giving the runner up position to Porsche. Toyota scores third with the latter third-party analytical firm, whereas CR chooses Buick for its best of the rest, General Motors’ international (North America/China/Europe) offering fourth with J.D. Power. Of course, its standing within these organizations’ two surveys moves up if we classify Buick in either the mainstream volume or premium sectors, and which of these two market segments to place the brand into will be up to your own personal viewpoint, and potentially which model we’re talking about. Having driven each Buick model (although admittedly it’s been a while since I’ve been in a Verano or Regal, and have only scheduled the new Envision for a weeklong test). We’ve got the new 2017 LaCrosse in the garage, and from my first few days of poking around and time spent at the wheel it seems to fit neatly in between brands like Toyota and Lexus, filling the entry-level luxury category. In some ways its miles more advanced than the competitive Toyota Avalon, especially with respect to powertrains, which by default gives it the nod over Lexus’ ES 350 as well. It’s nearly as premium-like as the similarly upscale Avalon and ES 350 too, with respect to interior finishings, materials quality, electronic interfaces, comfort, and quietness, while styling, inside and out, will come down to personal taste as always. My LaCrosse tester was finished in top-of-the-line Premium trim, which moves the price up from a base of $37,295 to $46,900, upgraded with AWD for an extra $2,450. 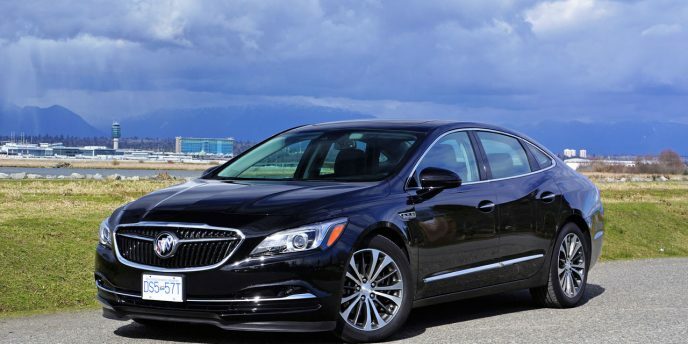 The $49,350 model is pretty good value for all you get, the base LaCrosse priced lower than Toyota’s flagship Avalon in base trim, yet this top-tier Buick Premium AWD considerably higher than the fully loaded Toyota, while you can add a few thousand more to the ES 350’s bottom line, while taking a number of features off its roster. I spoke of powertrains, the Toyota and Lexus cousins sharing the same 268 horsepower 3.5-litre V6 with 248 lb-ft of torque, six-speed automatic transmission with manual mode, and large mid-size front-wheel drive architecture, the Buick stepping things up with 3.6-litre V6 featuring 310 horsepower and 282 lb-ft of torque, an eight-speed automatic with manual mode and paddle shifters, plus in the case of my tester, all-wheel drive. Like I said, the LaCrosse definitely has the advantage in the powertrain department. I’m going to leave the comparo there, because to pull the Avalon and ES 350 into every aspect of this overview we’d need to do likewise with an impressive list of near full-size mainstream and mid-size E-segment luxury challengers, such as Chrysler’s 300, Nissan’s Maxima, and Kia’s Cadenza amongst volume brands, and Acura’s RLX, Genesis’ G80, Volvo’s S90, Infiniti’s Q70, Lincoln’s MKZ and Continental, Cadillac’s CTS and CT6, Lexus GS’, Jaguar’s XF, Audi’s A6, BMW’s 5 Series, and Mercedes’ E-Class on the higher end of the scale. In many ways the LaCrosse can compete in either class, the powertrain easily falling within premium expectations as noted, while its list of standard features fits more easily within the group of flagship mainstream models, with exterior features including 18-inch alloys on 235/50 all-seasons, active grille shutters, auto on/off articulating HID headlamps, halogen fog lamps, heated and powered side mirrors with integrated LED turn signals, laminated acoustic glass for the windshield and front-side windows, and remote start. Proximity-sensing keyless access lets you inside, while pushbutton ignition gets things going, with additional standard features including an electromechanical parking brake, illuminated vanity mirrors, a universal garage door opener, metal sill plates, a leather-wrapped multifunction, steering wheel, dual-zone auto climate control, a large 8.0-inch Buick IntelliLink infotainment touchscreen featuring a backup camera with active guidelines, Apple CarPlay and Android Auto phone integration, Bluetooth streaming audio, a 4G LTE Wi-Fi hotspot, dual USB ports, eight-speaker audio, active noise cancellation, eight-way powered front seats, leatherette upholstery, rear parking sensors, a fuel-saving auto start/stop system for the engine, helping the big Buick achieve a fairly thrifty claimed 11.2 L/100km in the city and 7.5 on the highway. Standard safety items include all the usual active and passive features plus a teen driving mode, tire pressure monitoring, and 10 airbags including side-thorax bags for the rear and knees airbags for both front occupants. There are two additional trim levels between base and as-tested Premium, including the $40,130 Preferred Group and $42,790 Essence Group, the former adding “Ultra-Bright” machine-finished 18-inch alloys, a powered tilt and telescopic steering column, satellite radio, a cargo net, an emergency tool kit, and the ability to add some option packages, while the latter Essence Group adds perforated leather upholstery, heatable front seats, two-way powered lumbar for the front passenger, driver’s seat and side mirror memory, auto-dimming side mirrors, wireless device charging, and yet more option packages. My Premium-trimmed tester upped the ante yet further with a head-up display, a heatable steering wheel, a massaging driver’s seat with four-way powered lumbar support, ventilated front seats, a household-style three-prong 120-volt power outlet, storage within the folding rear armrest, the Driver Confidence Package #1 that includes blindspot monitoring with rear cross-traffic alert and lane change alert, forward collision alert, a following distance indicator, lane keep assist, and a safety alert driver’s seat.